I had a pool installed last year and hired Rowan and his team to complete the landscaping in our backyard. Rowan presented various creative options using both permanent structures and horticultural options. 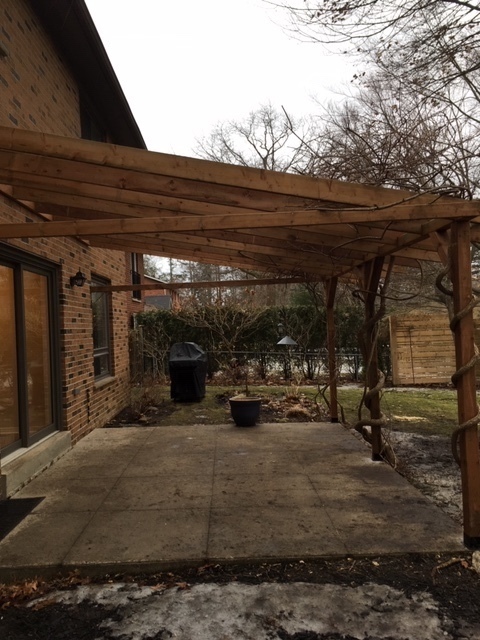 We ended up going with the combination of a tempered glass privacy screen and 8ft emerald cedars. Rowan and team were very professional and accommodating . 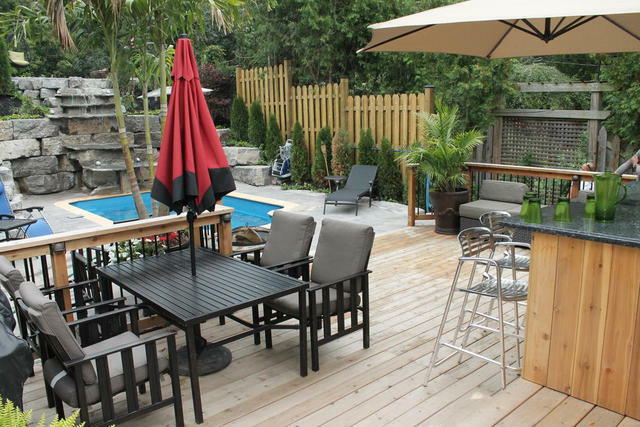 The finish product was very well done and compliments the backyard nicely. We thank you for the kind review. We always like to present a few options to the client to get their input and blend their style with our to create a unique, yet beautiful aesthetic. We are happy to hear you are enjoying your backyard and are looking forward to collaborating on our next project together. We will see you soon! The most valuable attribute a contractor can have is to run the business professionally and with integrity. We have used Rowan's services a couple of times now because he provides detailed written quotes, makes all appointments precisely on time, and the results have exceed expectations. He employs very skilled carpenters with years of experience and good people skills. Thank you for the kind words, DWW! We appreciate you noticing our integrity to the client and our commitment to each project. We always strive to exceed our clients expectations! We look forward to working with you on your next project! Rowan and his team are absolute professionals. The design was gorgeous, and the work was done with extreme attention to detail. I cannot recommend this company too highly. This is the second time we've dealt with them and we are very, very happy. Don't hire Rowan for a cheap job, hire him for a job extremely well done that will look good for years to come and add a great deal of value to your property. Wendy, Thank you so much for your kind words. 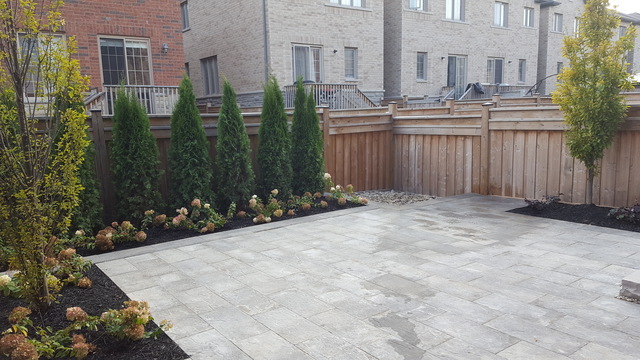 We thank you for the opportunity to do your backyard, and we acknowledge you for noticing our commitment to quality. We couldn't be happier for you, and all of us here were so happy with the outcome of your backyard project. We look forward to our next collaboration. Thank you from all of us here at Creative Gardens. This was the second time we contracted Rowan Henry to complete a renovation project for us. Rowan and crew previously completed a total reno of the 30 year old home we purchased. We were so impressed that we invited them back 3 years later to complete the stonework and landscaping around the pool we installed this summer. Rowan came prepared to discuss all options available to us and helped us with some solutions we never thought possible due to some tricky grading on our property. I didn't realize how much a landscaper plays an integral part of a pool install, however Rowan accurately advised the pool contractor what grading the pool should be installed at and worked very professionally with our pool contractor. 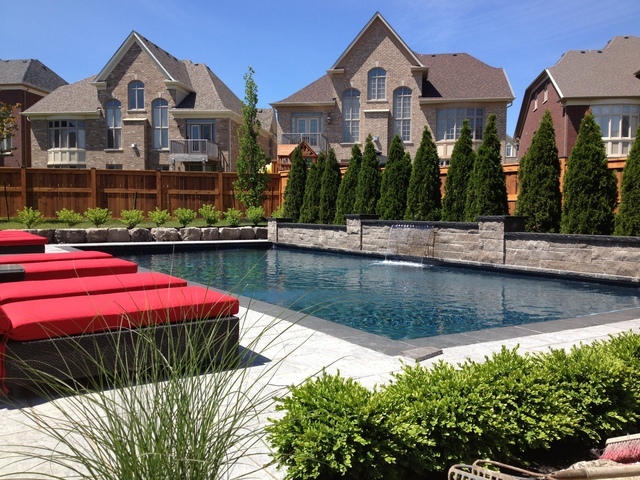 Once the pool was installed, his team proceeded to complete our backyard with beautiful stonework and landscaping. His crew is always timely and very professional. They never left a mess and were very mindful of our property. Rowan goes out of his way to ensure the job is proceeding as planned and always inspects the work completed and makes sure it is not only to our satisfaction, but also to his. Once again, the project was completed on time and on budget. I can't thank Rowan and crew enough for a job well done and helping us to enjoy our summer in our beautiful new backyard oasis. I would highly recommend Rowan for any indoor or outdoor renovation project. Norma, thank you for the kind words. We are so elated that your family is happy with your new oasis! The grading can be tricky in some backyards, and when it comes to a pool and stonework install, communication is critical for a seamless transition. We were happy to work on a successful collaboration with your pool contractor. We thank you for your time to write this and can't wait to work with you on the next project, Norma! All the best in the meantime! 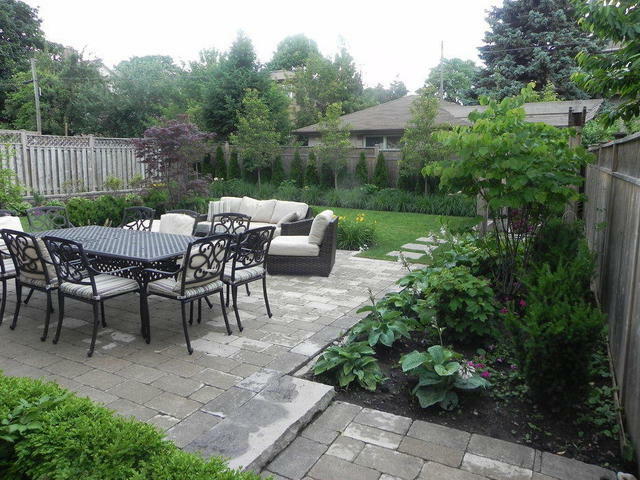 We had contacted several contractors over a 6 month period to start our backyard renovations. Several contractors with similar ratings on Home Stars didn't even call us back. From the start, Rowan Henry was courteous, knowledgeable and professional. He made you feel that our project was his own backyard renovation. 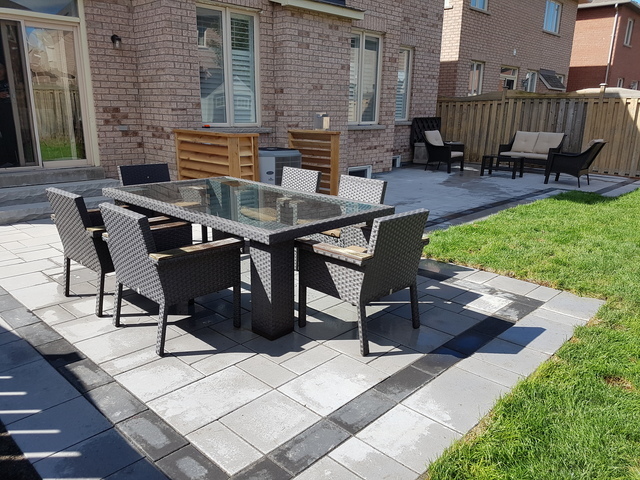 He was prompt to reply to our initial request for a quote and continued to give us unprecedented customer service as we worked with him to design our patio. As the process went along, it was evident that Rowan was extremely knowledgeable about his business. It was easy to place our trust in his work and company. We would highly recommend Rowan and Creative Gardens to anyone considering renovations. Throughout the design process, there were a few occasions where the patio design was altered from our original design. Rowan and Jerome immediately discussed the changes they needed to make in order to make our vision a reality. It is expected that there may be some discrepancies between plans and the final product. It's how the contractor responds to any changes is the true test. Without any hesitation, Creative Gardens came through and provided us with the patio we dreamed of. Also, the team of workers were outstanding. They were courteous, pleasant to talk with and extremely neat. They went above and beyond our expectations for cleanliness and attention to detail. Rowan worked very hard to keep us within budget; which is always challenging. He looked for alternative solutions and priced out other options while still delivering a high quality product and workmanship. Clearly the construction was just as important to Rowan. We look forward to having Creative Gardens back in the spring to finish off our Garden. Overall, the experience with Rowan and the Creative Garden Team was an exceptional one. So glad we had the opportunity to work with such dedicated people. Best of luck on your future projects. From the bottom of our company's heart, and our team, thank you so much for all of your recognition!! A review like this makes you realize how much a customer values not only what you do, but how you do it. Client communication is paramount for us to be successful. We always strive to maintain a win-win strategy. Sometimes we have to reinvent certain areas as we go along, but we will always keep you involved, and treat your home as our own. We here at Creative Gardens cannot wait for the spring to arrive so we may finish the next beautification phase of your home. Please send our warm regards to Rod also. We will see you both soon! Our job was likely a relatively small one for Creative Gardens but they attended to it with passion and an incredible attention to detail. There was a very run-down planter on the city side of the sidewalk in front of our house. Its technically on city property, but they don’t maintain it. Its a major eyesore and the bricks were coming apart and falling into the road and weeds were coming up everywhere. We asked Rowan, Jerome and team to rebuild it from the ground up, make it more durable and easy to maintain. But because its on city property, we wanted to keep the cost low. They delivered an incredible product on time and on budget. Throughout the process, Rowan reached out many times with work-around and creative solutions to keep within our budget. Communication was excellent and accurate. When they finished the rebuild I realized they had quietly done a few extras (Iike unexpected stone repairs and putting in a drip hose) at no extra cost. We are so thrilled with the final product. Couldn’t recommend them more highly! Awesome Work & Awesome Team! We met with several contractors and were not convinced until we met Rowan. Rowan was patient, creative and confident in his work and what he could deliver for us. We waited a few months for his team and were extremely pleased with the outcome and their schedule. Rowan was aware of every move his team made along the way and ensured that we stayed on course in time, cost and the expected design. Would strongly recommend Rowan and his team for your home project!! Thank you for the kind words, AF. We are so pleased to hear you are happy with the outcome of the project. We always strive to exceed expectations and stay ahead of the challenges. We thank you for a wonderful client experience and look fed to our next project together! Sincerely, Creative Gardens team. 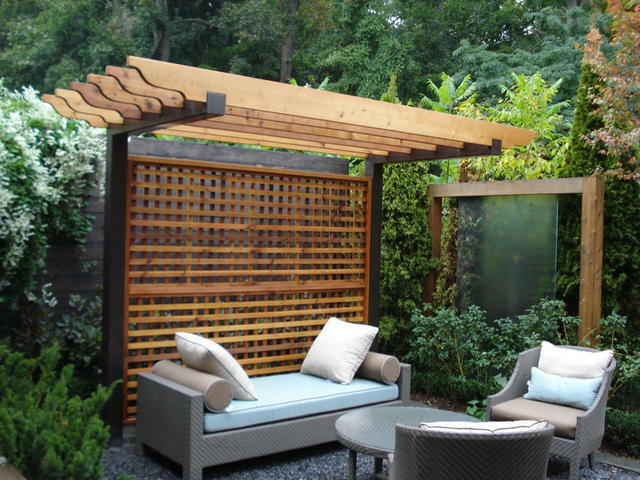 My husband and I had met with a few contractors, but Rowan Henry was the only one who presented us with a number of ideas and solutions for our backyard. It was refreshing to speak to a contractor who actually really listened to our needs and offered suggestions as to what we should do and how it would solve our issues. Our small backyard had a basic deck, no privacy, a catch basin and drainage issues that left our grass muddy and unsafe for our small children to use. 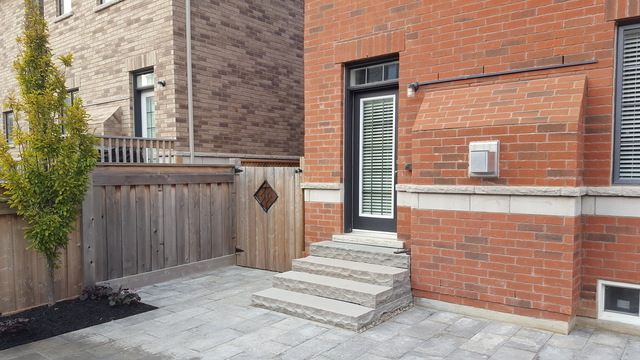 Rowan presented us with a design that would fix our drainage issues, maximize every inch of our backyard and incorporate landscaping that was minimal, clean and effective. He was the only contractor who did this and we were confident in our decision to choose Creative Gardens. 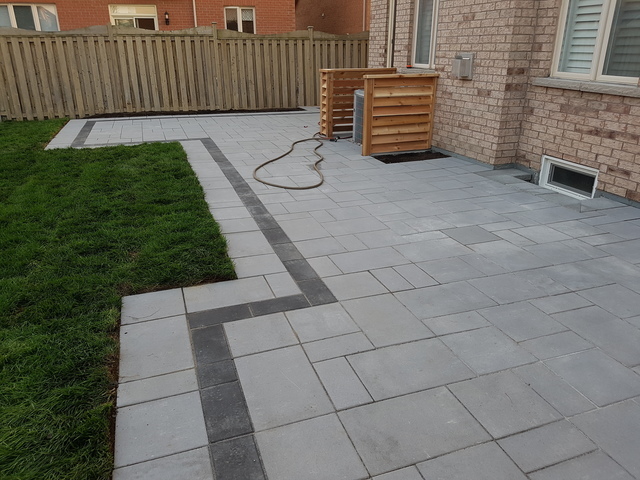 Due to the unusually rainy summer we had, our project started later than anticipated, but Rowan was always very responsive to any questions we had and kept us in the loop as to when our project would begin. When construction began, we had no complaints with the crew. They were hardworking, respectful, organized and cleaned up their work area at the end of each day. They never left an unnecessary mess on our property or the street. 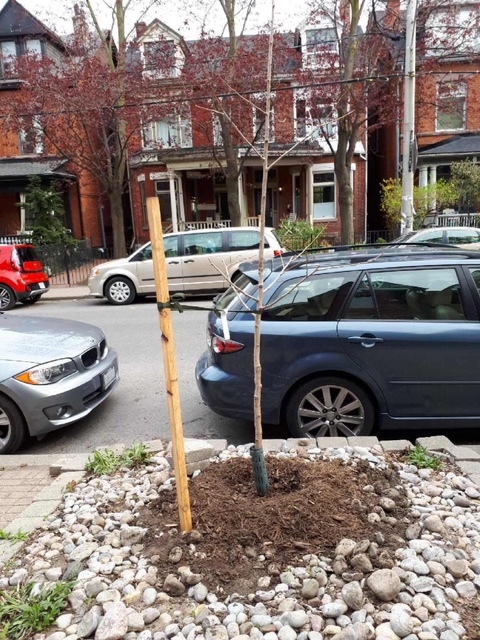 We even decided to do a bit of landscaping in our front yard last minute and they were able to accommodate that as well. We LOVE the transformation to our backyard and the improvement to our front yard. We couldn’t be happier with the experience we had and have even started recommending Creative Gardens to our friends. Rowan made the experience easy and stress-free. He is dedicated to producing quality and works hard to maintaining this high standard of work. We look forward to working with Rowan again in the near future! Thank you for the outstanding review Susan We are happy to hear that our work is appreciated by homeowners. We always strive to provide outstanding quality and customer service to all our projects. You were a pleasure to work with, and we are thrilled that the results turned out amazing. Rowan was recommended to me from a friend. He re designed my front yard. 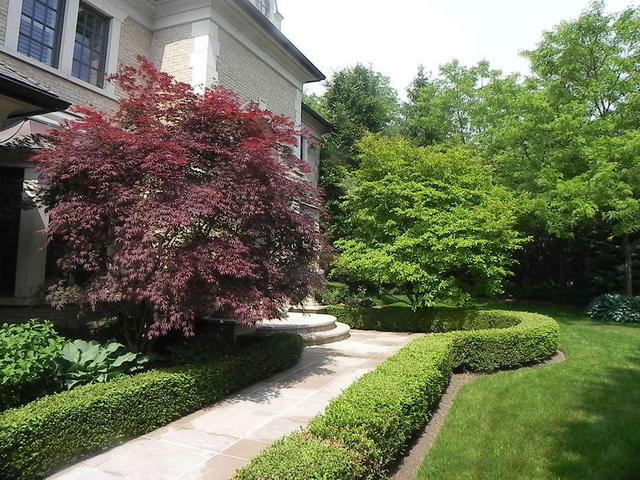 This included removing large trees and planting foundation plants and trees that complimented the house and yard. He also added some landscaping to my back yard. I was very pleased with the experience. He answered my questions with knowledge that comes with years of experience. He responded quickly to any emails, and he clearly is proud of his work and stands behind the work his company completes. I would recommend his company to anyone of my friends - in fact I already have. Thank you for the kind words Janet. Your garden and landscaping turned out beautiful. We are happy to know you enjoyed the experience with our team and are satisfied with the final results. We take great pleasure ensuring our clients are satisfied and love all the work completed. Thank you for the great review and recommending us. We look foreword to serving you in future. 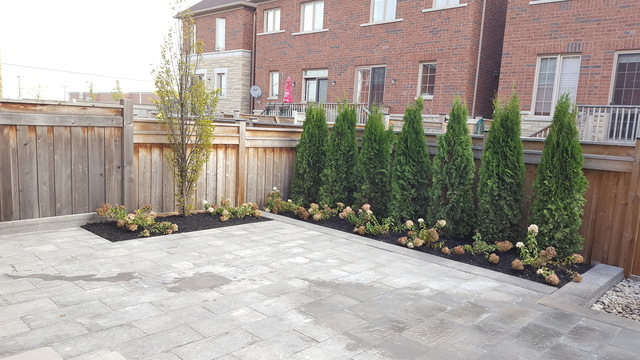 We're very happy with the service Kiel, Rowan and team delivered during and after they completed the landscaping job, and have been recommending them to some friends. We hired them to implement our garden design for our frontyard in the summer of 2015. They added their own touch through some fantastic input, and best of all, got the job done quite professionally and within just a few hours. In fact, they left no trace of being here when their crew and truck rolled away. That was impressive! About a year later, one of the cedar trees they had planted died. We contacted them for replacement (as per their tree warranty), and they delivered according promise! It was really refreshing to find highly professional folks in this trade. Elenor, thank you for the great review. We are happy to hear you are pleased with our service. 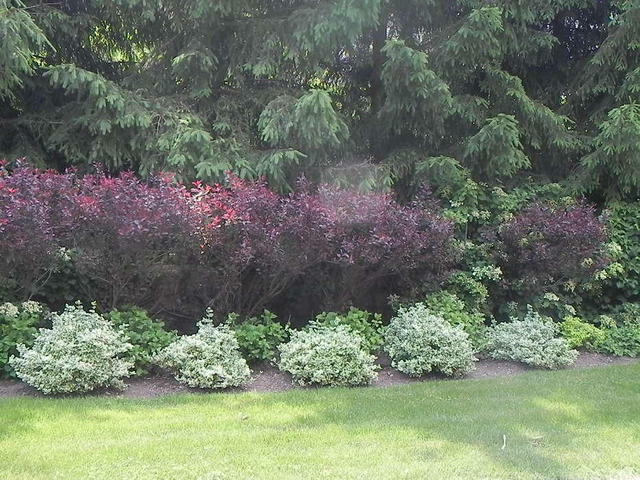 The front yard landscaping at your house turned out beautiful and elegant. It is our pleasure to ensure clients are happy way after the service is completed. Our team is dedicated to go the extra mile to ensure all work looks outstanding after completion. We truly appreciate your business & thank you for the great review. We look forward to serving you in the future for the backyard design & build. 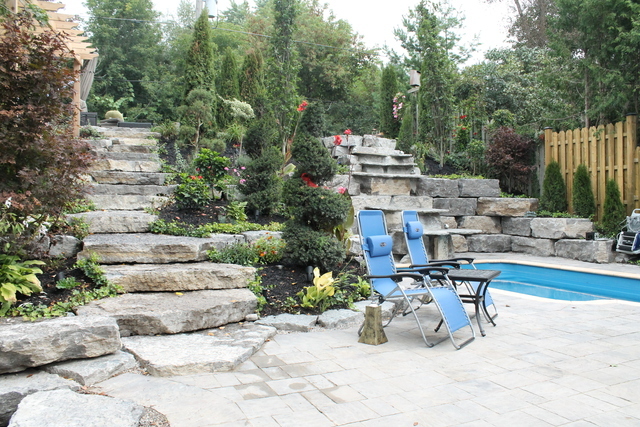 Stone, Interlocking Stone, Landscaping, Horticulture, Decks, Patio's.